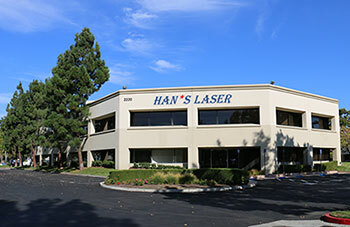 Han's Laser Corporation is a wholly owned subsidiary of Han's Laser Technology Group, a global leader in laser technology. We are committed to providing our customers with the latest industrial laser machine technology to better suit their special needs. Headquartered in the U.S. employed by knowledgeable trained personnel. 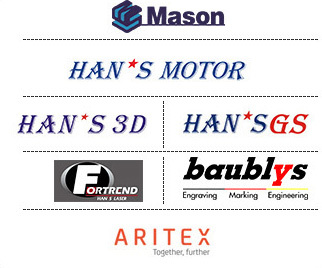 Han's Laser is transforming the industry into a state of the art machines. Technology Industry Group Co., Ltd, a public company that is established in 1996 has now become the flagship of Chinese national laser industry and the world's famous laser equipment manufacturer. Han's Laser went public in Shenzhen Stock Exchange Market in 2004. And as of today, its market value reaches more than 6 Billion USD. Han's Laser has more than 200 machine models, including Laser Engraving/Marking/Etching Series, Laser Welding Series, Laser Cutting Series, Sub-Surface Engraving Series, Laser Display Series, and so on. All these equipment have been widely used in the production of electronic appliances, integrated circuits, telecommunication equipment, computers, auto parts, glass and optical units, construction materials, medical devices, jewelry, packaging materials, crafts, fashion and clothing, urban illumination and other fields. Han's Laser has very strong research abilities. Our proficient R&D team has got more than 300 patents and dozens of software copyrights. Also, Han's Laser is one of the few companies in the world to have mastered the Ultraviolet Laser Patent Technology. We are fully committed and devoted to enhancing our technology leadership in the laser industry. Each product from Han's Laser is strictly examined according to ISO9001 (QCS) and ISO14001 (EMS) standards before it is put on to the market. Many laser equipment series have acquired CE certificate. 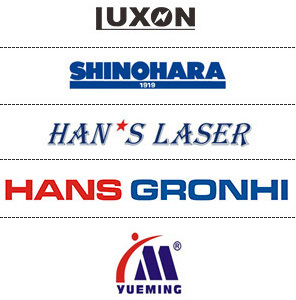 Han's Laser carries the hope and confidence to produce the world's first-class laser equipment. HAN'S Laser Corporation is a wholly owned subsidiary of Han’s Laser Technology Group, a global leader in laser technology. We are committed to providing our customers with the latest industrial laser machine technology to better suit their specialized needs. Headquartered in the U.S. and equipped with factory trained personnel, Han's Laser is committed to transforming the industry with our state of the art machines, and insiders knowledge of the functionality and unlimited capacity to our cutting-edge laser technology. Technology Industry Group Co., Ltd, a public company that is established in 1996, has now become the flagship of Chinese national laser industry and the world's famous laser equipment manufacturer. Han's Laser went public in Shenzhen Stock Exchange Market in 2004, and as of today, its market value reaches more than 4 Billion USD. 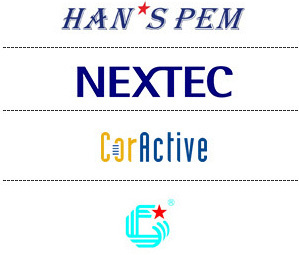 Achieved a sales revenue of USD 864 million. In April 2010, Han's headquarters building located in Shennan Road, Shenzhen, with a construction area of 7.7 million square meters was completed and put into use. In May 2010, Han's global production base located in Baoan District, Shenzhen with a construction area of ​​230,000 square meters was completed and put into use. In September 2010, Chairman Gao Yunfeng was named "Outstanding business people of Shenzhen Special Economic Zone in past 30 years" and kindly interviewed by General Secretary Hu Jintao. In October 2010, Company put forward "commercialized the general market, industrialized the strategic direction", focus on three main products engraving/marking, welding, cutting, deeply developed three industries PCB, LED and solar. In July 2010, President Prime Wen Jiabao kindly interviewed Chairman Gao Yunfeng. In 2009, Han's laser was named "National Torch Plan Key Hi-tech enterprise"Key Hi-Tech Enterprise of National Torch Plan" and "National Innovation Enterprise". In May 2009, the company reformed to laser application professional industry "professional industry of laser application" for the first time. In February, 2008, former general secretary of the CPC central committee, state President Jiang Zemin visited Han's Laser, praised "Han's Laser" has boldness of vision, praised for her bold vision, encouraged Han's laser to continue to put the national laser carry forward, in order to contribute to the promotion of national manufacturing industry development. In 2008, the company was named the first batch of "National Key High-Tech Enterprises." In 2008, the company was named "National Enterprise Technology Center." Han's laser was named "Guangdong Provincial Intellectual Property Excellent Enterprise". The "UV soft board cutting machine" project was named "National Torch Plan Project." Han's Laser was selected Shenzhen 100 stock index, Shenzhen Stock Exchange innovation index and SHSZ 300 index, stock value ranked fourth of listed laser companies in the world. In September 2006, Chairman Gao Yunfeng won the 2006 Shenzhen Mayor Award (Entrepreneur Award). Former Premier Li Peng, central political bureau standing committee Li Changchun, Vice Premier Wu Yi visited Han's laser. Han's laser successfully completed the equity division reform. The "a kind of third-harmonic method of laser generation" applied for U.S. patent. 2004-6-25, as one of the first eight stock of SME board successfully listed in Shenzhen Stock Exchange, stock title: Han's Laser, stock code: 002 008, The first high price of Shanghai and Shenzhen Stock Exchange that very day. (On June 25, 2004, Han's Laser successfully listed in Shenzhen Stock Exchange) Han's Laser moved to Han's Laser Building located in Technology Park, Nanshan District, with a construction area of ​​30,000 square meters. Wang Zhijiang, Academician of the Chinese Academy of Sciences was formally appointed the vice chairman and chief engineer of Han's Laser. Han's Laser was named "Key Software Enterprises of National Planning." In 2002, our laser marking machine occupied 71.96%.of the domestic market. In 2002, Chairman Gao Yunfeng proposed the enterprise philosophy "Faith, Service, Dedication, Perseverance". In the end of 2001, Han's Laser brought in Hongta Group, China Merchants Group, Hualing Iron & Steel Group to reconstruct Han's to be Shenzhen Han's Laser Technology Co., Ltd.
Academician Wang Daheng which is the leading authority of optics visited Han's Laser and was appointed the technology consultant of Han's Laser. Han’s Laser brought in 4.38 million Yuan risk investment from Shenzhen Hi-Tech Industry Investment Service Co., LTD to reconstruct Han's Laser Technology Co., Ltd. registered capital of RMB 8.6 million Yuan. The "YAG Laser Marking Machine Enterprise Standard" drafted by Chairman Gao Yunfeng was officially put on records. Han’s Laser developed the first set of galvanometer marking software "Han's Laser Marking System for Dos" which has independent intellectual property rights. In April 2010, Han's headquarters building located in Shennan Road, Shenzhen, with a construction area of 7.7 million square meters was completed and put into use. In May 2010, Han's global production base located in Baoan District, Shenzhen with a construction area of ​​230,000 square meters was completed and put into use. In September 2010, Chairman Gao Yunfeng was named "Outstanding business people of Shenzhen Special Economic Zone in past 30 years" and kindly interviewed by General Secretary Hu Jintao. In October 2010, Company put forward "commercialized the general market, industrialized the strategic direction", focus on three main products engraving/marking, welding, cutting, deeply developed three industries PCB, LED and solar. In July 2010, President Prime Wen Jiabao kindly interviewed Chairman Gao Yunfeng. In February, 2008, former general secretary of the CPC central committee, state President Jiang Zemin visited Han's Laser, praised "Han's Laser" has boldness of vision, praised for her bold vision, encouraged Han's laser to continue to put the national laser carry forward, in order to contribute to the promotion of national manufacturing industry development. In 2008, the company was named the first batch of "National Key High-Tech Enterprises." In 2008, the company was named "National Enterprise Technology Center." Han's laser was named "Guangdong Provincial Intellectual Property Excellent Enterprise". The "UV soft board cutting machine" project was named "National Torch Plan Project." Han's Laser was selected Shenzhen 100 stock index, Shenzhen Stock Exchange innovation index and SHSZ 300 index, stock value ranked fourth of listed laser companies in the world. In September 2006, Chairman Gao Yunfeng won the 2006 Shenzhen Mayor Award (Entrepreneur Award). Former Premier Li Peng, central political bureau standing committee Li Changchun, Vice Premier Wu Yi visited Han's laser. The "a kind of third-harmonic method of laser generation" applied for U.S. patent. Han's Laser moved to Han's Laser Building located in Technology Park, Nanshan District, with a construction area of ​​30,000 square meters. Wang Zhijiang, Academician of the Chinese Academy of Sciences was formally appointed the vice chairman and chief engineer of Han's Laser. Han's Laser was named "Key Software Enterprises of National Planning." In 2002, our laser marking machine occupied 71.96%.of the domestic market. In 2002, Chairman Gao Yunfeng proposed the enterprise philosophy "Faith, Service, Dedication, Perseverance".